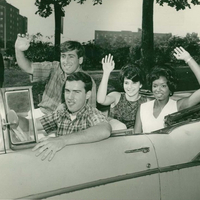 This is a 1963 photo of Queens College CORE members Leonard Hausman (steering wheel), Stan Shaw (White male), Rosalind Andrews (White female) and Carolyn Hubbard (Black female). Both Shaw and Hubbard were chairmen different times. In the photo, they are leaving for Virginia as part of their Student Help Program, a tutoring project aimed at Black kids shut out of the Prince Edward County public schools in an effort to curb desegregation. 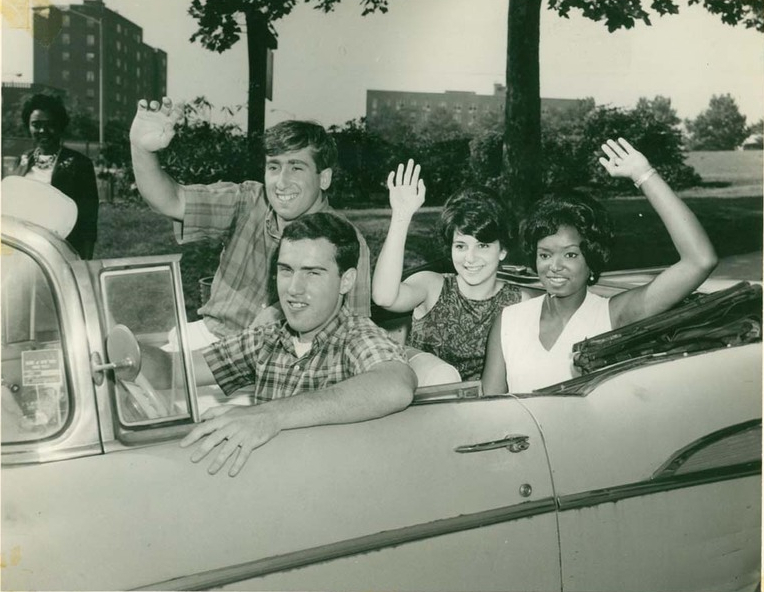 Howard Krimko, “photo of Stan Shaw, Carolyn Hubbard, Leonard Hausman, and Rosalind Andrews, Queens College CORE ,” corenyc.org, accessed April 21, 2019, http://www.corenyc.org/omeka/items/show/157.